02:21 — Doctor Who: Sixth Doctor’s final adventure coming. 05:54 — Doctor Who: LEGO. 11:18 — The Musketeers: Gets a third season. 14:35 — Doctor Who: Comic book getting UK release. 19:13 – Invasion of the Body Snatchers (1978). 29:00 – Flotsum and Jetsam. 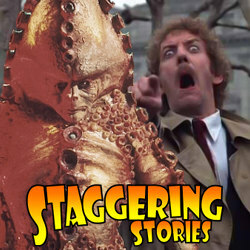 50:03 – Doctor Who: Terror of the Zygons. 73:25 – Farewell for this podcast! 74:04 — End theme, disclaimer, copyright, etc. LEGO Ideas: Doctor Who and Companions. YouTube: Lego Doctor Who – The Time of the Doctor. Wikipedia: Invasion of the Body Snatchers (1978 film). BBC: Doctor Who – Terror of the Zygons. Wikipedia: Doctor Who – Terror of the Zygons. Mad Norwegian Press: Companion Piece – Women Celebrate the Humans, Aliens and Tin Dogs of Doctor Who. Mad Norwegian Press: Companion Piece Table of Contents.